The University of North Carolina at Greensboro is a leading student-centered university, linking the Piedmont Triad to the world through learning, discovery and service. UNCG’s motto of “Service” is carried out in numerous ways across campus as students are encouraged to become involved in the life of the community. Essential to this mission is developing and maintaining strong partnerships with local agencies, schools, nonprofit organizations and government agencies. The Office of Leadership and Civic Engagement (OLCE) strives to be a bridge between the campus and the greater community. Interested in partnering with UNCG and OLCE? First, consider connecting with us in the following ways, then check out our Partnership Opportunities for specific ways to collaborate. GivePulse – GivePulse is our online service platform containing information about community organizations in Greensboro and beyond. Information includes everything from contact information, volunteer positions, community-based research questions and more. New organizations can check out GivePulse here. For instructions on how to register with GivePulse, please click here: Welcome to Givepulse. OLCE Weekly Announcements – During the academic year we send out weekly announcements about upcoming civic and community engagement opportunities to 3,000 students, staff, and faculty. We also include on-campus events, conference and professional development opportunities, and internship and job announcements that are related to civic leadership and service. If you would like to submit an announcement to our weekly listerv please email lead@uncg.edu with the subject line: “For OLCE Weekly Annoucnements”. Note: Internships can also be formally posted with the UNCG Career Services Center. 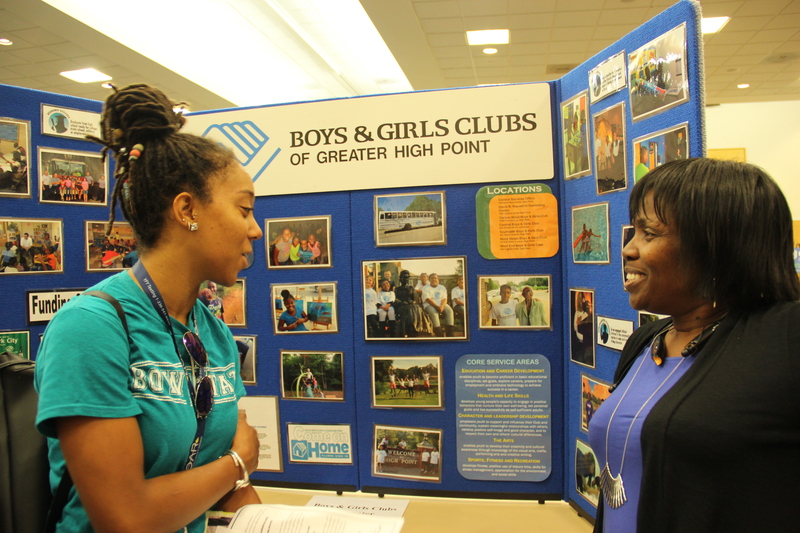 Volunteer & Service-Learning Fair – This annual on-campus fair typically hosts about 50 community organizations and attracts close to 300 students looking for opportunities to volunteer in the Greensboro community. This event typically happens during the first week in September. Add your partnership to “The Collaboratory” – an effort by UNCG’s Institute for Community and Economic Engagement (ICEE), this database of community-UNCG partnerships provides a full portrait of the community engagement landscape at UNCG. Posting Internships, Part-Time & Full-Time Jobs – Organizations offering part-time, full-time, and internship opportunities are welcome to make an account and post their positions on SpartanCareers (https://uncg-csm.symplicity.com/employers/). Other ways to connect with the UNCG Career Services Center include attending Career Fairs and networking nights or hosting information tables and coffee carts. For questions or more information, please contact the Career Services Center at 336-334-5454. Not sure where to start or need help? Contact OLCE at (336) 256-0538 or e-mail lead@uncg.edu and we will be happy to assist.